I went into hospital on Sunday night (19th August) and they were going to break my waters on Monday morning. Well I'd been in hospital for about an hour and a half and my waters broke on their own!! It was quite a relief - I wasn't looking forward to having them broken for me! I didn't sleep all that night - I was waiting for the contractions to start - I tried to walk about as much as possible which was uncomfortable as I kept leaking water everywhere!! Well Monday morning finally came - I was on a high but apprehensive at the same time - I hate needles and didn't really want to have an epidural or the drip to start my contractions off (I had a drip instead of pessaries as they could then control my contractions as I had a small baby and they didn't want her to get distressed)! The doctors came round earlier than expected and my mum hadn't arrived at the hospital when the midwife came for me to start me off - and I was a little upset and scared. I settled into the labour room and constantly watched the door for my mum to walk in. The midwife was busy preparing everything and just as she walked towards me with the needle to set the drip up my mum walked in!!! The relief was immense!!! So the drip was started at 9.45am. The monitor was put onto the baby's heartbeat and we settled back and watched TV while we waited for things to get going. 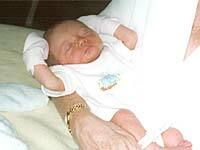 The midwife increased the dosage of the drip every 15 minutes and then at about 11.45 my contractions started. The TENS machine was put on me. My sister and brother-in-law then arrived at about 12.45 as moral support for both me and my mum. My brother-in-law didn't come in the labour room but waited outside in the waiting room and walking around the hospital grounds. I managed to continue with the TENS for quite a while, I can't remember how long exactly but I built the power up in it gradually, the pain then became too much and I went onto the gas and air (lovely stuff!!) I'd managed to get to 5cms by the time the midwife recommended that I have an epidural - I knew that this was likely as if the baby got distressed they would want to do a caesarean so I agreed. I was past caring if it was going to hurt (gas and air had taken over!). The anaesthetist was excellent I hardly felt a thing!! My mum was holding my shoulders but when they came to do the epidural she was busy watching the needles (I have to admit I told her off a bit but that's the only time I lost control!) instead of concentrating on helping me breathe with the gas and air so my sister took over whilst my mum had a seat!!! I then didn't need the gas and air once the epidural had kicked in (shame!). They had to stop the drip controlling my contractions whilst inserting the epidural and then had to start building them up again. I can't remember how much time passed between having the epidural and the next bit but know that I watched Ready Steady Cook and some of the Weakest Link. Anyway the monitor kept losing the baby's heartbeat (to say I was worried was an understatement) - the midwife brought in another monitor which has a clip that is attached to the baby's head, we then got the heartbeat back again (huge sigh of relief) - by this time I was 9cm dilated! What seemed to be a short time after having the clip put onto the baby's head, I started to have a contraction that I could feel - the midwife topped up the epidural but the pain just wouldn't go - then the baby's heartbeat disappeared off the monitor again, the midwife went to get the doctor and I promptly burst into tears, I was so scared, many a time during my pregnancy I thought I was going to lose my baby as I'd had bleeds and now I'd got so close to giving birth to her and there were complications. My sister came over to me and comforted me, within seconds the midwife reappeared with the doctor, just as they entered the room the alarm sounded on the monitor, the doctor told me that the baby was going to have to come out NOW and I was going to have a crash caesarean - all of a sudden the room was full of people and the bed I was on was being pushed out of the labour room and we were running towards the theatre, the drip was taken out of my arm just in time and the monitors wheeled alongside, I'm not a religious person at all but prayed that my baby girl would be alright. In the theatre it was all systems go - I have no idea how many people were in there but there seemed to be loads. I remember panicking and telling the anaesthetist that I could feel my tummy still but he checked me over with this cold spray and proved to me that I couldn't!!! My mum came and sat by the side of me, no one except my mum and the anaesthetist spoke to me they were all so busy - then after what felt like someone rummaging around in my tummy, at 6.16pm this enormous cry was let out, (sorry crying as I type this, it was the best moment of my life! ), my little girl was born, weighing in at a tiny 4lb 1oz, she was put straight under the lights and I looked to the side of me and could see her, she was very busy looking around her - I promptly burst into tears and the paediatrician came over and told me that she was fine!! I was then sewn up (a very neat job I'm told, I'm too squeamish to look!) and taken back to the labour ward where my sister and her husband were waiting. They had been allowed to wait outside the theatre so they could hear Elena's first cry!!! What seemed like the next few hours I spent drifting in and out of consciousness, while Elena had her Vitamin K injection and other various things done and my mum, sister and brother-in-law spent the time video recording her first minutes and taking photos, unfortunately I couldn't hold Elena to begin with as my hands were numb, but my sister held her next to me and my brother-in-law took a picture of me with her like that - what with me drifting in and out of consciousness it's going to make a very attractive photo!!! When my family had gone home and the numbness had gone in my hands and could hold my little bundle - and we had a good chat and loads of kisses before being wheeled up to the ward for the night. I couldn't sleep then, although I was still numb from the chest down, I just lay there staring at her, the midwives kept telling me to get some rest but how can you when you have something so perfectly beautiful laying next to you? We left hospital on Friday afternoon and we're getting into a routine now!! Apparently according to the report that they give you on leaving hospital - the caesarean took 3 minutes!!! I knew they were quick but was amazed it was that quick!!! The whole team were excellent and I really couldn't thank them enough!!! I'd recommend the TENS machine but it needs to be put on from the minute the first contraction starts! Gas and air - fantastic stuff!! Epidural - seeing as I didn't want one I now wouldn't hesitate in recommending one!!! Elena Mai is now just over 6 weeks old and weighs 5lb 15oz!